The three things most-suggested that we didn't include in the original bucket list were to visit Priest Lake, summit Mt. Borah, and soak in Lava Hot Springs. 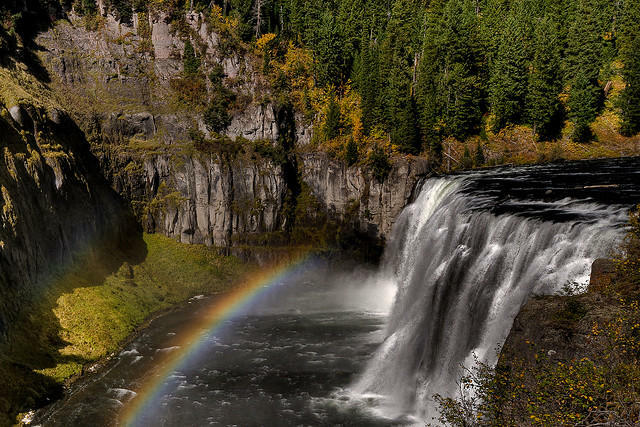 This is Upper Mesa Falls near Ashton, Idaho off Highway 47. We rounded up many of the suggestions you sent us, and have 35 more things to add to the Idaho bucket list! 110. Bike or ski at Schweitzer Mountain. 109. See the Mormon Temple in Idaho Falls. 108. See the City of Rocks in Cassia County. 107. Tour a fish hatchery. 106. Take a dip in Bear Lake, a lake on the border with Idaho and Utah. 105. Visit the Morley Nelson Snake River Birds of Prey National Recreation Area 20 miles south of Boise. 104. Dig for garnets outside Clarkia. 103. See Number Hill in Arco. 102. Attend the Eastern Idaho State Fair. 101. Visit Register Rock, located in Massacre Rocks State Park near American Falls, to see names carved by pioneers passing through. 100. Stand at the top of the Salmon, Payette and Boise River systems in the Sawtooths. 99. Take a fall drive from Boise to Moscow. 98. Get an 'atomic burger' at Pickle’s Place in Arco. 97. Play a tune at the Yellow Pine Harmonica Festival. 96. Sample Idaho-grown wine at a local winery. 95. See a porcupine race on July 4 in Council. 94. Attend the Caldwell Night Rodeo. 93. Attend Paul Bunyan Days in St. Maries. 92. Visit outdoorsman Buckskin Bill’s place, now a museum, along the Salmon River. 91. Visit the Monastery of St. Gertrude in Cottonwood. 90. Camp in a national forest. 89. Attend the Sun Valley Film Festival. 88. Attend the Shoshone-Bannock Indian Festival in Fort Hall. Cottonwood, Idaho is home to this beagle-shaped bed and breakfast. 87. Dig your own Idaho potatoes. 86. Snowmobile to the top of the Selkirks in north Idaho. 85. See the Idaho Falls fireworks show on July 4. 84. Tour the Old Idaho State Penitentiary. 83. Slide down the natural waterslide at Lion’s Head near Priest Lake. 82. Attend the annual Orofino Lumberjack Days. 81. Attend a Braun Brothers concert. 80. Summit Mt. Borah, Idaho’s tallest peak. 79. 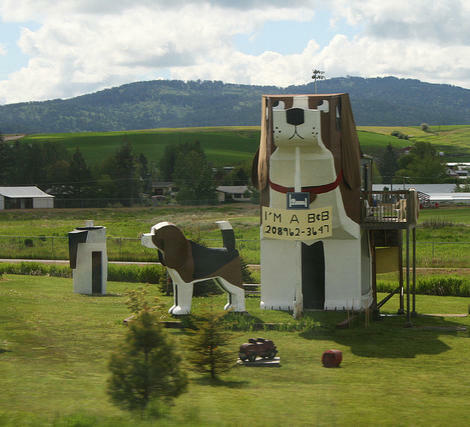 Stay at the Dog Bark Park Inn, known as “the world’s largest beagle-shaped” bed and breakfast in Cottonwood. 78. Soak in Lava Hot Springs. 77. Visit Mesa Falls near Ashton. 76. Swim in Priest Lake. Plus, here are more of your comments we received on Twitter. You may be best suited to live in Idaho if you're agreeable and not very extroverted. That's according to data compiled by a group of multinational researchers who've sliced the United States into distinct regions based on personality types. The regions were determined by personality test data from more than 1 million Americans. Western states fall mostly in the "relaxed and creative" category, while states on the East Coast are largely deemed "temperamental and uninhibited". Is Idaho Really In The Middle Of Nowhere? Idahoans (or really anyone who lives in the rural west) often joke they live in the middle of nowhere. As it turns out, parts of Idaho really are in the middle of nowhere – at least according to Vizual Statistix. And when it comes to planning a city’s future, Boise is looking to Jaap Vos. He is the director of the Department of Community and Regional Planning at Boise State University. Vos moved to town a year ago, and is building the academic program that will produce a new group of city planners. Editor’s note, June 2018: It’s been five years since this story was first published and it continues to be one of our most popular posts. Thanks to all who have read, shared and commented on this story.